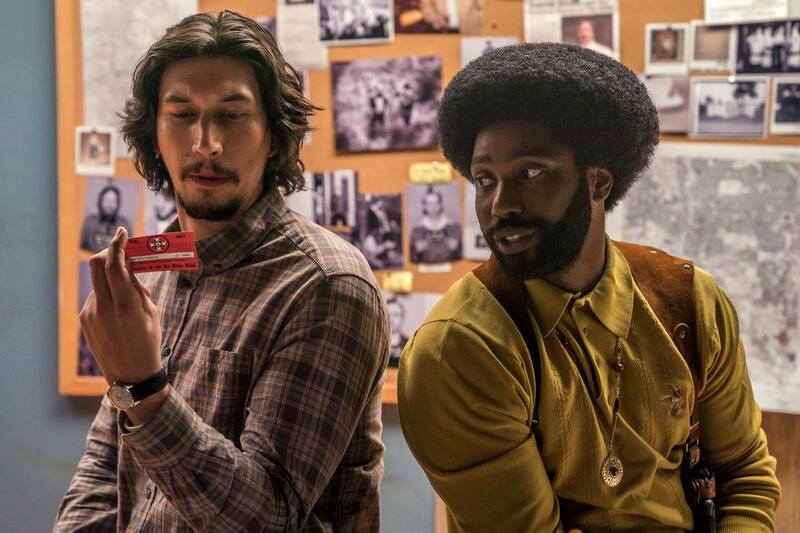 Aaron Neuwirth reviews BlacKkKlansman, the Spike Lee joint based on the wild true story of a black detective infiltrating the KKK. When Spike Lee is armed with a vision and the proper means to produce a film, he can truly strike down on the intended targets. 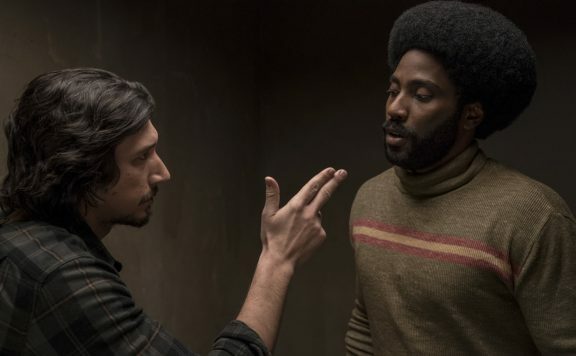 Not that BlacKkKlansman functions as an attack, but it is an incendiary motion picture focused on pointing an angry figure at the things still very wrong with society concerning racial politics. Never presenting his films in a manner that merely address specific issues, Lee dives headfirst into the problems he sees. This time Lee has a great plot to work with, the true story of a black Colorado detective infiltrating the Ku Klux Klan. Blending the drama with his loquacious wit, the result is one of Lee’s very best films. Even before the real plot of the film kicks in, one can see the sort of fire Lee wants to light under audiences. BlacKkKlansman opens with the famous wide shot from Gone with the Wind, where a horrified Scarlett O-Hara staggers through a sea of dead Confederate soldiers, only to move to outtakes of a pre-segregation spokesperson portrayed by Alec Baldwin espousing racist vitriol. This is a movie that wants to get into some serious topics, and it makes sure to put a stamp on everything by closing with footage from Charlottesville, North Carolina, specifically the tiki-torch hate march and the people who dared stand up to them, only to be run down by a car. BlacKkKlansman fittingly opens in theaters on the one-year anniversary of these rallies, but it’s mostly a flashback to groovier, yet hateful times. 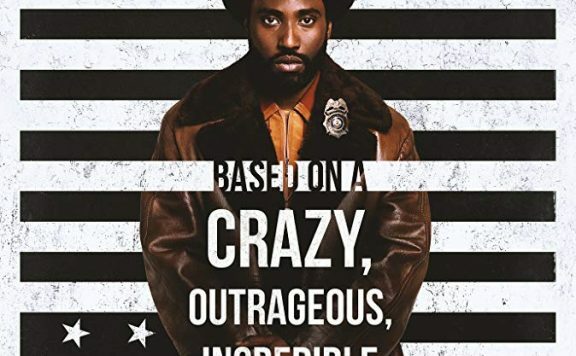 John David Washington (son of Denzel) stars as Ron Stallworth, the first African-American detective to serve in the Colorado Springs Police Department. As you can tell by Ron’s afro, it’s the early 1970s. As the struggle for civil rights rages on, Ron decides to embark upon a dangerous mission. After seeing an ad in the local newspaper, Ron calls the local chapter of the KKK in an attempt to join the group secretly. To his surprise, the Klan hears Ron out over the phone, leading to a predicament. Since Ron obviously can’t physically meet with these people, Detective Flip Zimmerman (Adam Driver), poses as Ron in person. Together, work is done to disrupt activities of the Klan. 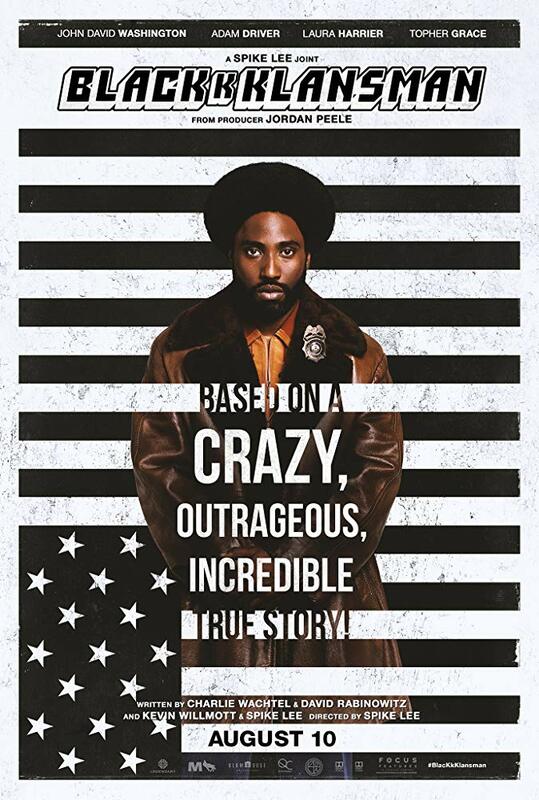 While the story is as high concept as it gets for Lee and his interests, the screenplay has been adapted from the book Black Klansman, by the real Ron Stallworth. Still, regardless of whatever liberties were taken, the film manages to feel strikingly authentic thanks to how matter-of-fact Lee tends to present his subjects. There’s plenty to praise when it comes to Lee’s artistry in putting together a great-looking movie that juxtaposes characters with specific imagery, moves the camera around in interesting ways, and has it all held together through a jazzy Terence Blanchard score. However, as far as how Lee attempts to comment on particular scenarios, little has to be done to portray the absurdity of the Klan. Even with this in mind, BlacKkKlansman still manages to be wildly entertaining. It’s fitting that Jordan Peele serves as a producer on the film, as not unlike his Oscar-winning Get Out, BlacKkKlansman serves as a social thriller that puts characters into extreme scenarios and adds a dose of humor to counter the sort of language, actions, and portrayals found on the screen. 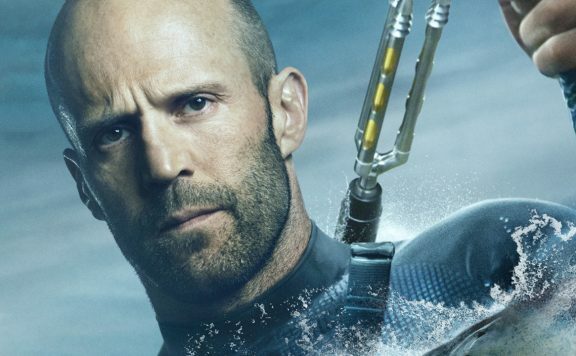 While the film may initially present a scenario ridiculous enough to get a kick out of what’s on display, there is a horrific angle to consider as the world these characters occupy is outrageous yet based in reality. While I may expect this film to be Lee’s most successful since Inside Man, it won’t be surprising to know the smiles and moments of laughter die down as the film continues moving forward. With Grace’s performance as Duke and the various aspects surrounding the character and his Klan activities, it’s easy to see what Lee is getting at as far as addressing just how little has changed. 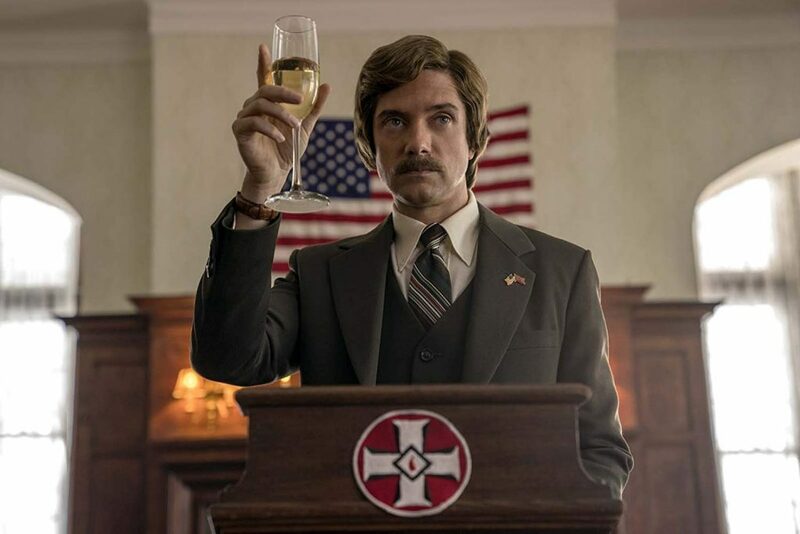 Having Duke monologue his way into chanting, “America first,” and eventually having the film settle on presenting utterly contemptible people in power keeps BlacKkKlansman from ever feeling like uplifting entertainment. This stands even as the plot around Ron and Flip works to show just how adept these guys were at putting one over on the Klan and their maniacal schemes. The journey Ron goes on is certainly not worth missing out on though. While many biopics settle on the cinematic Wikipedia presentation of events, Lee is far cannier than the average filmmaker. Incorporating the struggles of the black population in Colorado Springs in the 70s allows for a romantic subplot that further reflects the difficulties of Ron’s journey. 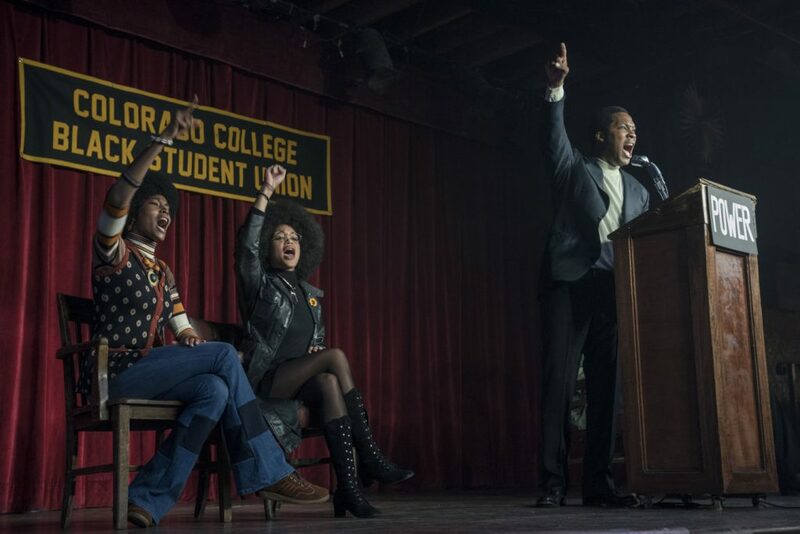 Following undercover surveillance of a meeting led by the developer of the Black Power movement, Kwame Ture (Corey Hawkins), Ron meets Patrice (Laura Harrier), a fellow Afro-wearing black individual fighting for civil rights. This pairing lets Lee place two smart, black people in scenes together, debating opinions on what makes the most sense to help further change. For all the thoughts that some may have on Lee only presenting one side of things, we also hear from Ron, a cop, who stands up for fellow officers, internalizing certain indiscretions, and facing off with a strong-willed person through candid dialogue. It’s not an area as inherently exciting as Flip’s adventures posing as a white supremacist, but the two-hour-plus runtime is hardly filled with dead air. Keeping Flip in mind, however, Driver continues to prove how great a talent he is. Having to balance between being a reasonable, Jewish officer of the law with Ron (complete with excellent dialogue sparring), and a full-on racist with the Klan is both exciting and hard to take in at times. It makes Driver’s role plenty affecting. There’s some solid support from the various cast members on both sides as well, but the real highlight is Washington. It is entirely fitting to see the son of the man who rightfully achieved so much acclaim for his various roles in Lee’s films provide such a striking performance here. Given that we’ve arrived in a newer generation for Lee to continue expressing himself, it’s plenty fitting to have this younger Washington in play. As Ron, Washington affects an attitude and voice that helps push the film right to the line of proper satire. Even while presenting a version of the truth, it’s the boldness that Washington gives off which keeps him feeling in control of his situation and the audience never loses sight of that confidence. 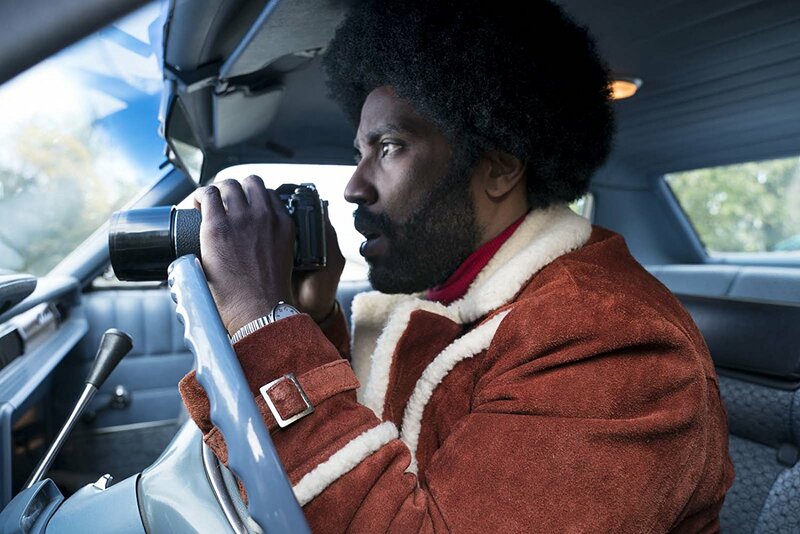 His chemistry with all the other characters, including Grace, is exactly what it needs to be to make BlacKkKlansman work as an outrageous, yet fitting portrayal of what an authentic cinematic look at American society would come up as. Some critics thought Do the Right Thing was extreme enough to inspire rioting among black audiences. Malcolm X faced a variety of controversies because of how Lee chose to adapt that story. Bamboozled was ahead of its time in the way it looked at how the media would decide to appropriate black culture. In between these features are numerous other examples of how Lee chooses to express himself and show just how well a dynamic filmmaker can tell stories that entertain and aren’t afraid of going too far. Some are great; others miss their mark. BlacKkKlansman stands high as one of Lee’s most accomplished works. The film has already earned the Grand Prix at the 2018 Cannes Film Festival. I look forward to seeing how far it continues to travel, even as it questions a society at risk of moving too far backward.